From rail fan friend Bill Volkmer, comes this nice photo of OERM’s narrow gauge darling car, no. 525, taking a breather at the Bonnie Brae & Beverly Boulevard terminal of the D line. The 525 is celebrating its 40th birthday, doing what it has done for 4 decades, that is, providing dependable service for whatever car line it was assigned to, on the vast LARY rail system. In this case, the D line about a year before the lines abandonment in Aug of 1947. So far, the #525 HAS dodged the scrappers torch. At one time, more then 750 Huntington Standards roamed the streets of Los Angeles. But with the arrival in 1937 of LARY’s beautiful shiny new PCCs , the retirement of hundreds of battle weary Standards began. Only World War II extended the lives of several hundred Standards, whose days were already numbered just before December 7, 1941. When LATL bought out the operations of the LARY at the end of the War, the retirement and scrapping of the remaining Standards began again at a relentless pace. Standards were retired and scrapped by the hundreds after the big 1947 rail abandonments. A few “lucky” Standards like OERM’s no. 665 were bought up by 20th Century Fox Studios. 20th Century Fox bought a total of three Standards, the other two were “butchered” in an attempt to make them look like New York City streetcars for an unknown movie. After this “modification”, about the only thing recognizable of the 2 cars were their narrow GAUGE arch bar trucks . The #665 remained untouched. By early 1950, the last remaining Standards were running out their time on the 2-man V line. By mid-1950, the last remaining Standards entered “Dead Storage” at DIVISION 1. 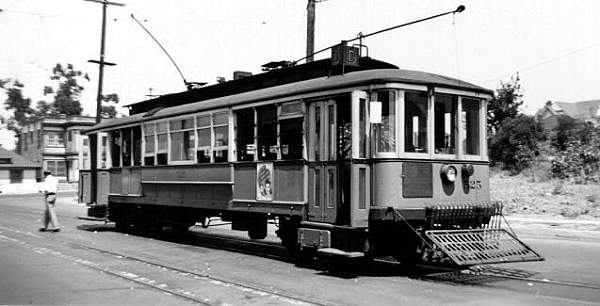 In 1952, car no. 536 was given to the children of Los Angeles (the little brats) and placed on display at Travel Town. Car #521 went to Seashore Trolley Museum where it sits on static display to this day. And then there was ONE! The #525 was PURCHASED by the Southern California Division of the ERA, which later became today’s ERHA-SC. And so the 525 lives on in active retirement along with sister car 665, the last of their breed. The 525 has been refurbished and can be found at the Orange Empire Railway Museum, occasionally operating on the museum’s demonstration railway. It has been restored to reflect the appearance of LARy cars from approximately 1935 to 1945.